Let’s face it; Growth Promotion Testing of culture media is likely not at the top of your "favorite lab activities" list. We get it, which is why we created EZ-Accu Shot. It provides a fast, convenient and reliable solution for Growth Promotion Testing, Media Challenge Testing and more. Each instant-dissolve microorganism pellet is designed to deliver 10-100 CFU per inoculum and provides 8 hours of stability after rehydration, so you can meet Pharmacopeia guidelines with ease. 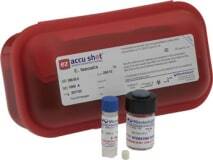 EZ-Accu Shot Select contains the five compendial microorganism strains for Growth Promotion Testing in one convenient kit. The instant dissolve microorganism pellets are designed to deliver 10-100 CFU per inoculum with no serial dilutions and they provide 8 hours of stability after rehydration for added flexibility to perform tests. Plus, each strain is just three passages from the reference culture, so they meet Pharmacopeia standards.